Peppers need sun and heat. They need a well-drained, reasonably fertile soil. If the soil is too rich this could result in lots of lush growth, but not much fruit. Always sow fresh seed. 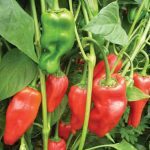 Peppers need high light intensity, and humidity from misting with a fine water spray on the leaves first thing in the morning. If possible, germinate the seeds using a heated propagator to give peppers an early start in March. 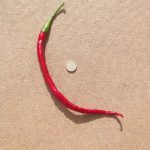 The longer the whole growing season, the larger and also the hotter (in the case of chillies) they will become. Sweet (bell) peppers have no heat and are grown for their succulent flavours. 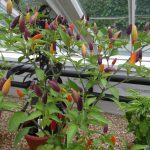 Chilli peppers can have a very fiery flavour depending on the variety you choose. Beware of handling hot peppers. Do not rub your eyes. The heat rating is measured in Scoville Units – from 0 up to 300,000+ for very hot peppers. Sow seeds at the beginning of April on a windowsill, preferably a month earlier if you have a heated propagator and a greenhouse. Fill a plug tray with seed compost and firm each plug so it is flat and level. Place one seed in each. Cover seeds thinly with sieved compost. Water, and cover with clear plastic or glass, and put a piece of newspaper on top of this. Turn over the plastic or glass daily. Place in the warm until the seeds germinate. Seeds germinate at 21C degrees. As soon as the seeds germinate, remove the plastic or glass. Grow on at 18C degrees. Water regularly. Feed once a week with a balanced liquid organic fertiliser. When the seedlings have four true leaves, they will need to be potted on to larger pots. Plant them into pots of 7.5cm diameter using organic multipurpose compost. Water regularly and feed weekly. They need a warm place and to get as much top light as possible. Grow the peppers on until the roots are beginning to show through the base of the pots. When the first flowers are showing, pot them on to their final large pots (25cm diameter +), using organic multi-purpose compost. Gradually harden them off as the weather warms up. 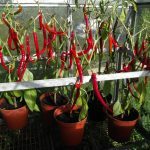 They can be grown on in a warm sunny sheltered place outside from mid June, or in an unheated greenhouse or polytunnel. Place the pots 45cm apart each way. Small pots of French Marigolds (Tagetes) – the bedding type of marigold – can be dotted around the greenhouse to help deter any whitefly. The plants will produce side shoots. To encourage further side shoots, the growing tip can be cut off when the plant is 15cm tall. Support the plants as they get taller by tying the side branches to thin canes. Regularly mist the leaves with water very early in the day. This helps the fruit to set. Do not water the leaves when they are in strong sunlight. Keep the greenhouse well ventilated. Once the fruit starts to form, change to a high potash feed, such as a seaweed-based tomato fertiliser and feed every 10 days. At this stage give enough water to stop the roots from drying out, but be careful not to overwater. 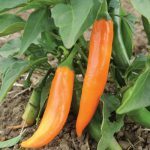 Peppers need a long growing season and can be ripening well into the autumn. If a frost is likely the plants must be protected with horticultural fleece (purchased by the metre). Harvest Pick immature pods to encourage cropping. 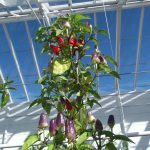 Chilli peppers can be harvested green for mild flavour, or yellow for a bit hotter, or left until the heat has developed. At the end of the season, if frosts are forecast, the whole plants can be uprooted and hung upside down in a frost-free shed or greenhouse. The peppers will continue ripening.